There are more calories in your food than you think It happens to many, many slimmers who are trying to lose fat in a controlled way while maintaining muscle mass. They keep track of exactly how much they eat, and make sure that they consume a few hundred kcals less than they burn each day. But nothing happens. The fat stays where it is. How come this happens? 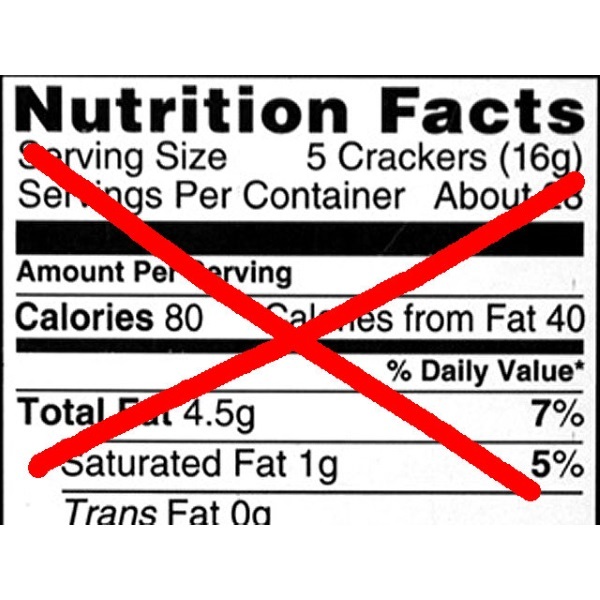 Food manufacturers consistently report fewer kcals on their food labels than the products actually contain. In 2013 the New York based filmmaker Casey Neistat posted The Calorie Detective on the web. It’s a five-minute clip that should be compulsory viewing for everyone who a. wants to lose weight and b. trusts the food industry. Neistat bought five foods that he likes to eat and took them to researchers at Columbia University, who analysed exactly how many kcals the products contained. And – surprise! – they contained more than the manufacturers had declared. If Neistat had eaten all five products on the same day, he’d have consumed 548 kcal more than the information on the labels indicated. The number of kcals measured nearly always exceeded the number of kcals the manufacturers and sellers announced. The first figure below refers to products provided by restaurants. The horizontal axis represents the number of kcals the restaurants said were in their products; the vertical axis represents the number of kcals the researchers found. Where the value on the vertical axis is 0, it means that the researchers found as many kcals in the product as the makers claimed. Where the value is +10, the researchers found 10 percent more kcals in the product than the makers claimed. The figure above shows the results for ready-made supermarket meals. Once again, the labels consistently underestimate the number of kcals. More data on the products analysed are reproduced in the table below. Click on it and a larger version will appear. The researchers confined their study to low-calorie meals. You’d expect these foods to be accurately labelled with the amount of calories they contain, but on average they contained 8 percent more kcals than the labels indicated. We’re not aware of any similar research on European food products, but we suspect the situation is no better than in the US. We hear only too often about European bodybuilders who have worked out in minute detail the amount they eat, yet don’t lose weight even though their calculations indicate that they are consuming a couple of hundred kcals less than they are burning. The bodybuilders nearly always use the data provided on the labels. The solution is simple: prepare and cook as much of your food as possible yourself, using pure ingredients, and avoid ready-made products. Every calorie-counter book will give you the exact number of calories for real foods like potatoes, vegetables, fruit, meat, eggs and fish. What’s more, a real food diet is much healthier too. J Am Diet Assoc. 2010 Jan; 110(1): 116-23.